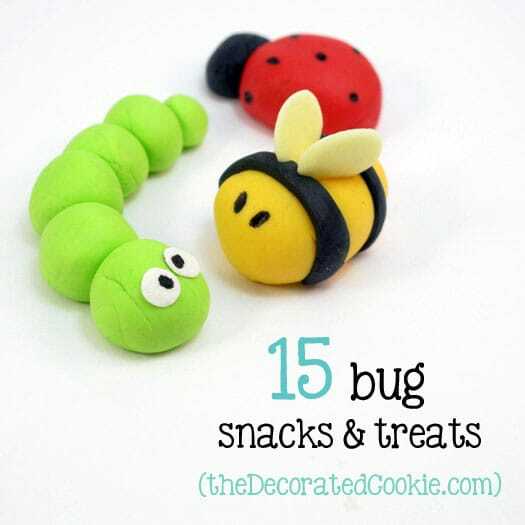 15 EDIBLE BUGS and INSECTS -- fun snacks and treats for kids. Why would you need an edible bugs roundup? I don’t know. Bug party? Love of critters? Summer picnic party or BBQ? Ever since my run-in with that centipede (millipede? jillipede?) last week, I’ve had bugs on my mind. Shudder. I am not a friend to bugs. I don’t need to hear the lectures on their benefits to the environment. I’m perfectly happy to let bugs be and do their work. Outside. Even when I help my husband garden (and by “help,” I mean pick stuff from his garden, and usually only when he’s out of town and unable to do it), I wear gloves and then screech pathetically if I’m surprised by something creepy and crawly, which I am. Every time. (So why am I surprised?) I can manage catching lightning bugs with my daughter, but only just barely. I’m not proud of this ick thing I have. I want to have more fortitude. I just don’t see that happening. 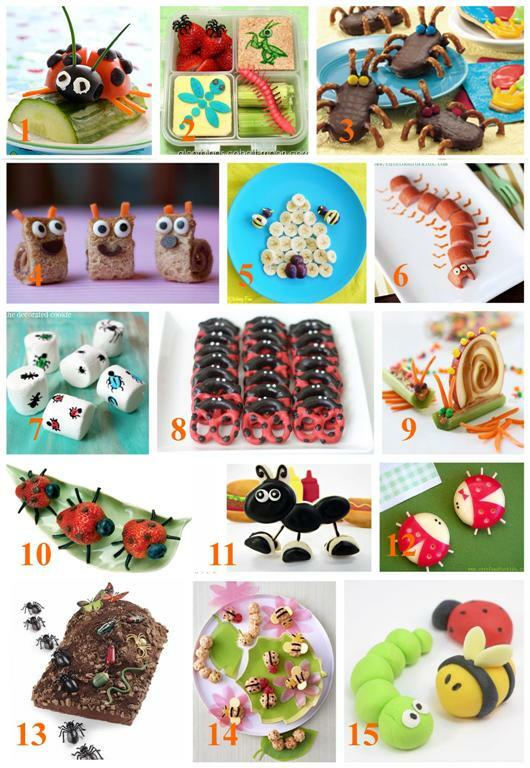 When searching for bug-themed food, google offered me some horribly un-cute images. I scratched myself in my frazzled freaked-outness of it all trying to get all the imaginary bugs off me. Injury by bug-images. So the ones I chose are cute and totally not-icky. 1. Bug snack from Parents. 2. Bug bento from Glory’s Mischief. 3. Bug cookies at Tablespoon. 4. PB and J snails at Bento Mama. 5. Beehive snack from Kitchen Fun with My 3 Sons. 6. Caterpillar hotdog, from Cute Food For Kids. 8. Ladybug pretzels from Bee in Our Bonnet. 9. 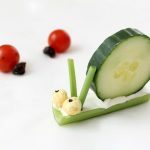 Snail snack from Meals.com. 10. Strawberry ladybugs at National Wildlife Federation. 11. Standing up ant cookies from The Bearfoot Baker. 12. Babybel ladybug from Cute Food for Kids. 13. Bug mountain cake from Spoonful. 14. Rice Krispies Treats bugs from Martha Stewart. 15. 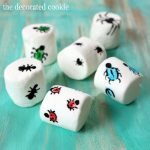 Fondant bugs for cupcakes or cakes at the decorated cookie. What a cute collection! It kills me that I am the bug killer in our house! Even spiders on the ceiling in the middle of the night-the kids always yell out for Mom!!! How did that happen!!! Oooh, Lizy, not in my house. Spiders are my worst fear! What cute bugs … these are the kind I like! I want tomato plants, but don’t want to encounter those worms. Who knew bugs could be so cute! I usually don’t like bugs, but I’m lovin’ your bug collection!